Interested in the Android app? The Android app and firmware can be used for any DIY controller which is using an Arduino board. The app will receive new features and functions continuously. New features can be requested by any customer. Connect any motion equipment which is using a stepper motor. 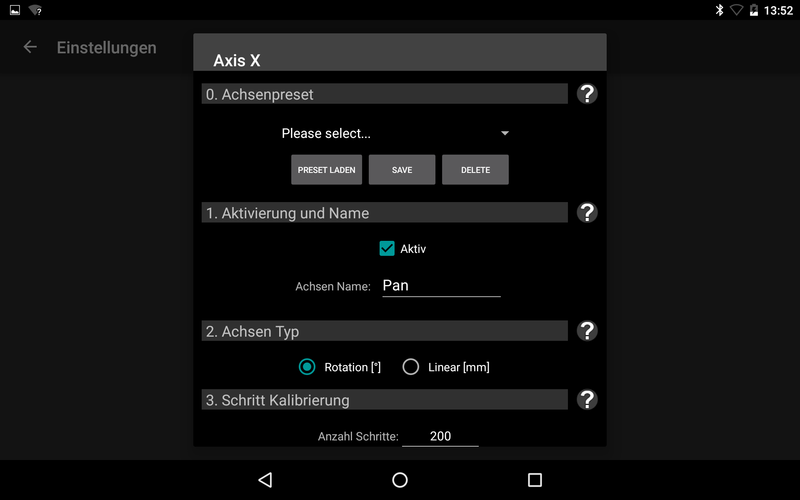 The app enables the possibility to set all important parameters individually for each stepper. Up to 6 axis can be controlled simultaneously. The standard mode for stillstand picture timelapse sequences. Also known as shot-move-shot, since the camera will only exposure in between the movements. This mode can also be used for stop-motion photography, macro stacking and other applications. If you need a automatic continuous movement for video shooting, you can do this with the video mode. Just setup the keyframes, choose the moving duration and let it run automatically. 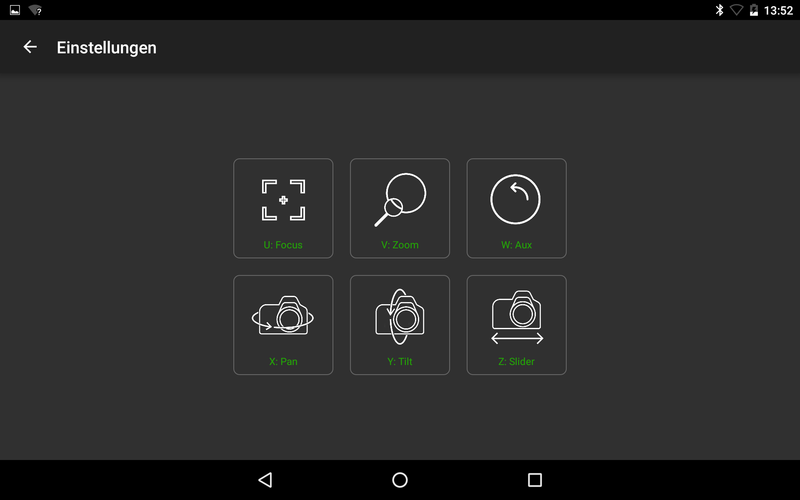 You can easily switch between video and timelapse mode and use the video mode as a preview for your timelapse sequence. This mode is also know as gigapan mode. Just set the overlap and two corners of the panorama, and all pictures in between will be made automatically. With this functionality you can use tele-lenses to create panoramic images with several hundred single images and get a ultra-high-resolution image as result. When shooting stars or other astro object, you need to consider the movement of the earth. Otherwise the objects will get blurry or turn into lines. With the astro mode, you can compesate the earth movement and do exposures of several seconds or even minutes. What Android devices are compatible? The app requires at least Android 5.0 (Lollipop) and Bluetooth 4.0. The Android app was developed and tested on different smartphones and tablet from different brands. So the app is compatible with most modern devices. Due to different implemention of the Bluetooth communication by the device manufacturer, some devices might not work or will have some issues. What devices can be controlled? 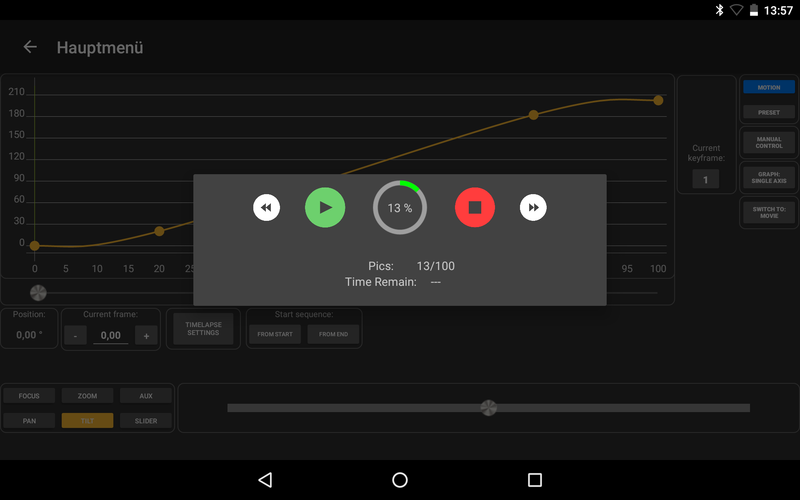 The Android app is originally developed for our PureControl. This has a Teensy 3.6 as control board and is 100% compatible. Older versions of the PureControl used an Arduino Due as Control board, so this is also compatible. But because of the lower processing power, some functions might work slower/differently. Other Arduino boards are not recommended, because some functions require a certain processing power. Furthermore, you will need a HM-10 bluetooth module for the connection. Other modules will required adjustments within the app and are not supported. Is there a demo version of the app for first testing? If you want to build your own DIY controller and test the setup and compatibility with your device, you can simply download the PureMoCo app within the Google Play Store. 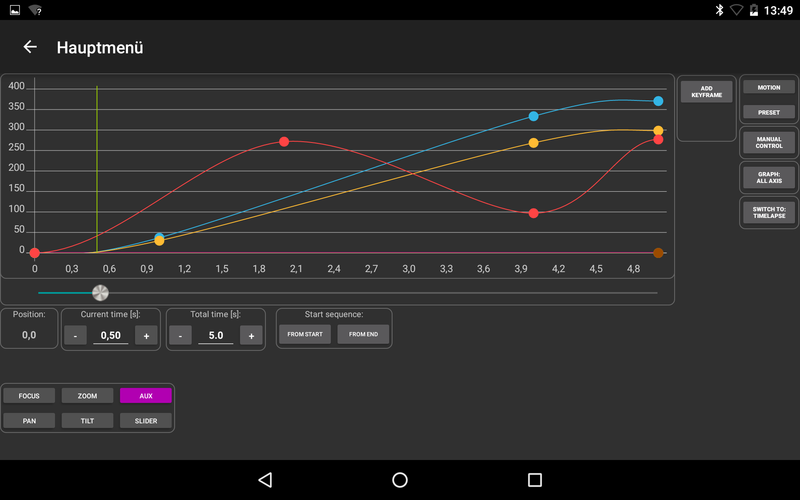 This demo version will offer you manual control of only one axis. All other functions are disabled and only available in the full version. Where do I find the suitable firmware? The Android app always requires the according firmware on the controller. You can find the firmware in the Support part of the website. For a DIY controller, you can refer to the Pin-Layout which can be found in the Download-section. The firmware is open-source, so you can make any adjustments by yourself.